A year ago today, Ali Ismail Korkmaz was beaten to death by police. From the start, Turkish authorities seemed determined to undermine the quest for justice in the case. Following the attack, the Governor of Eskisehir said that police hadn’t been involved and that Ali Ismail Korkmaz had been beaten up ‘by his friends.’ Footage from a CCTV camera was deleted in the days following the incident, but was subsequently recovered by experts from the gendarmerie. Ali Ismail was only 19 years old. He deserved a long and happy life. Now his family, and other families like his, deserve justice. Amnesty has been following the case from the start and has observed every hearing of the trial. Join us in working to ensure that the culture of impunity which has allowed so many young lives to be cut short in Turkey is brought to an end. Join us in ensuring that Ali Ismail’s family receives the justice they deserve. 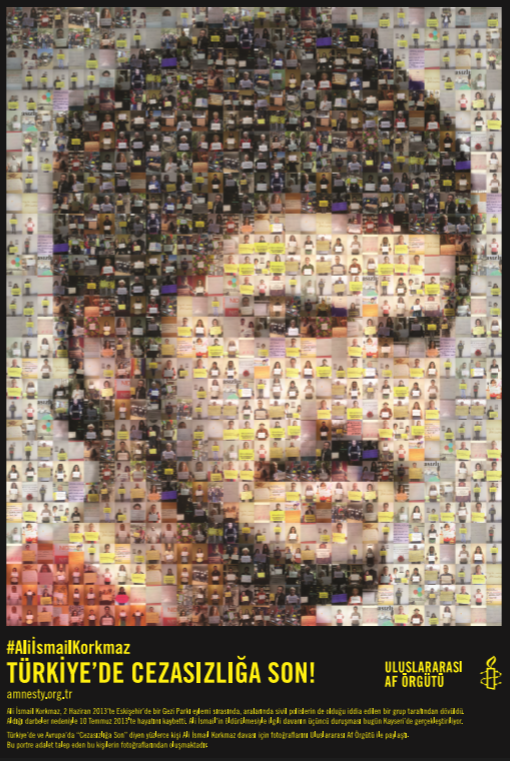 Calling an end to impunity in the case of Ali Ismail Korkmaz. The image contains thousands of people worldwide who have joined in our campaign. This entry was posted in Amnesty International, Andrew Gardner, Excessive Force, Freedom of Expression, Gezi Park, Taksim, Turkey, Uncategorized and tagged Ali Ismail, Ali Ismail Korkmaz, Amnesty, Andrew Gardner, Gezi Park, impunity, Taksim, Turkey. Bookmark the permalink.